Post pictures of the Norwegian Royals wearing bunads during official occasions, celebrations or parties. Please name the date or occasion. July 27, 1996 - Wedding of Alexander Ferner in Holmenkollen kapelle, Oslo. Sonja, Haakon and Märtha Louise wearing bunads. Mette-Marit in a fantasy bunad that made the "bunad police" go crazy, very serious thing "bunad"
Ari Behn wearing his new bunad in the CP wedding, no complaints on him!! Mette-Marit making the bunad police very happy in a real bunad from Rogaland, the were also very pleased that Haakon choose to wear his Fana bunad. May 17, 2004 - National Day Celebration. Haakon and Mette-Marit at Skaugum. http://www.vg.no/bilder/bildarkiv/998749847.jpg Ari in Bunad from the Crown Prince Wedding. Haakon and Mette-Marit, both in Bunad before the wedding. Haakon wears a bunad from Fana, outside of Bergen, which he, according to VG, received when he was stationed in Bergen as part of his military service. Mette-Marit wears a Jelsa bunad from Rogaland. You can see that this picture is taken before the marriage, as her belt is black, save for the silver buckle. Women who are married have a wife-belt, covered in silver. This is probably to show that their husbands are wealthy, and that the woman is taken. You can see example of that belt from the picture Mandy posted above. December 5, 1996 - Sonja lighting the Christmas tree lights in Trafalgar Square. May 17, 1994 - Sonja, Harald and Märtha Louise celebrating National Day at Skaugum. So this must be the Asker bunad. Am I correct? What a wonderful idea for a thread, Mandy and norwegianne! The traditional Norwegian costume is very beautiful. It seems that the traditional costume for men is usually the same but from these pictures I supposed the women must wear different ones when visiting different parts of Norway. Any idea on how many of these traditional costumes the Queen, Mette-Marit and Martha Louise each possess? A few more images of the lovely Norwegian costume to add to this lovely thread Mandy and norwegianne have started. May 17, 1978 - Norway's National Day. Sonja and Märtha Louise wearing bunads at Skaugum. 1981 - Märtha Louise appearing on the TV program,Titten Tei og Trond-Viggo, in Norway. She was the first royal to appear on a TV program. April 1, 1982 - Märtha Louise, Haakon and a group of children entertained the Spanish Royals during a City Hall Reception. Very cute pictures of young Martha Louise donning a bunad. 1988 - In 1988 Märtha Louise danced in a bunad with Mads Ousdal. He went on to become star. February 12, 1994 - Opening Ceremonies of the Lillehammer Olympic Games. August 12, 1994 - Märtha Louise opened the International Folklore Dance Festival. UPPA Pictures. The male costumes do vary, most of them do have the basic black jacket and pants, but there are some where it happens in other colours, like white. If you see Ari and Haakon's bunads, there's plenty of differences between them. The male bunads can have hats, or not. The number of buttons on the vest may vary, as may the socks, the shirt, the vest, etc. Sonja is definitely the one who has the most bunads, though I wouldn't try to make an estimate even. She wears the Asker, and the Telemark bunad, the most often. But she has others. Märtha has a Telemark, an Asker, one from Setesdal (which was used mostly when she danced folk dances.) I also think she has one from Hardanger. There might be others here as well. Mette-Marit has the Jelsa bunad, which she has had since her confirmation. She also has a Hardanger bunad, methinks. I'm relatively sure that if it hasn't happened yet, she will get an Asker bunad. 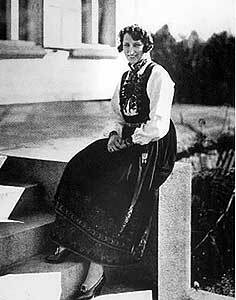 I heard that Ingrid Alexandra would get a bunad from Agder, once upon a time (it was mentioned in the media at the time of her birth.) But I would presume that she will end up with more than enough bunads from all over the country. What presisely Astrid and Ragnhild has, I'm unsure about. http://gfx.dagbladet.no/nyheter/2001...habryllup9.jpg Crown Princess Märtha in Vest-Telemark bunad. how many bunads are there in norway? maybe each city has its own?